I have a fun, personalized project to share with you today! We’re going to start the project by printing off the letter of your choice is a festive font! I chose “N” for Natalie, typed it up, and printed it out. I used the Onyx typeface, which I believe came standard on my computer. Once you print out your letter, trace it onto your fabric. We’re going to start by using the satin stitch for the serifed areas. As I’m sure you’ve figured out, I never do the satin stitch. Because I never use the satin stitch, I’m not very good at it! So this project is practice for me! Use a larger than normal back stitch for the straight lines. Do the same for the other side of the letter. We’re going to satin stitch the entire center portion of the letter. This is where you really get the see the variations in the thread! Keep going until you reach the bottom! To make the edges look cleaner, we’re going to add a few of the large back stitches around the edge of the satin stitch. Add it to the other side as well. I also added a stitch across the bottom just to clean it up a bit. Now we’re going to use our silver thread to stitch a wreath around the outside of the letter. Use the feather stitch for this portion and alternate the side that the “feather” falls on. I didn’t realize until after I’d stitched around the entire hoop that I had the wrong number of feathers. The first and last one ended up being on the same side! Oh no!! To fix that problem, I went back with the straight stitch and added a second feather. Now we can add some French knot flowers. I triple wrapped all of these French knots. So pretty! I love the color variations! Once the knots are complete, our project is done! I had a few setbacks with this project, but I love the way it turned out! The silver thread really brings out the little silver spots in my fabric! 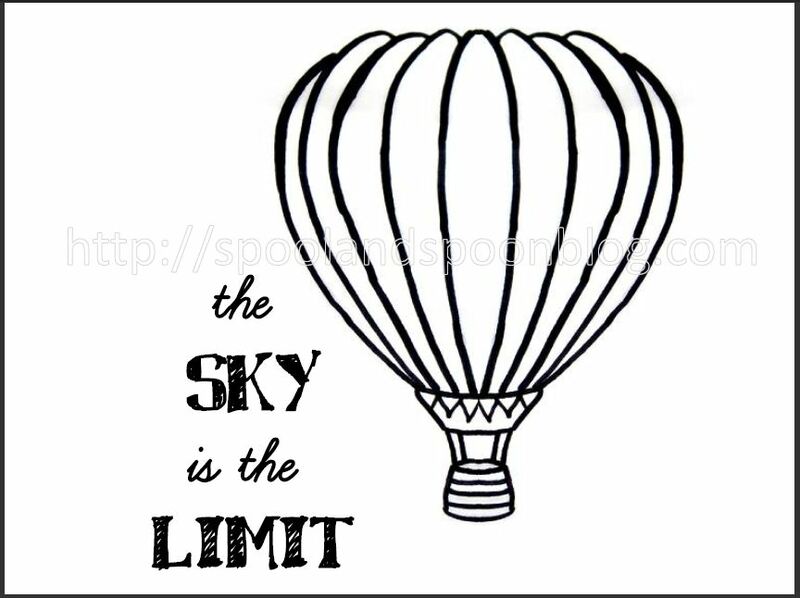 I found this cute hot air balloon motif on Pinterest. You can find it here! After printing off the motif, trace it, and hoop your fabric. Start by Back Stitching the balloon. This project is super easy and is made with only the Back Stitch and a few Straight Stitches. Keep Back Stitching until the balloon is complete. Split your thread into two strands of three. You’ll be using strands of three for the remainder of this project. Use one of the strands of three to stitch this zig zaggy portion of the motif. Continue using one of your strands of three to Straight Stitch the ropes that tether the balloon to its basket. Back Stitch the little basket. Add a few straight stitches across to complete the basket and our hot air balloon! I love the way the pink and yellow look together! I’m going to go back in a few days and add some embellishments to the balloon! There will be a separate tutorial for that! Happy Crafting! I chose this floss specifically for the fun color variations! This is the phrase motif we’ll be using. I picked two complementary fonts off my computer and typed out my desired phrase. You’re more than welcome to use my font choices, or you can choose some fonts of your own! We’re going to start by tracing the phrase onto our fabric. If you like the Satin Stitch, do that! I think it would look very pretty here! Continue Back Stitching until “Rise” is complete. I contemplated using the Stem/Outline Stitch for the “and,” but in the end, I decided to stick with the Back Stitch. Just like we did with “Rise,” begin Back Stitching the word “Shine.” Once “Shine” is complete, our project is done! I absolutely love how cheerful and bright this turned out! We’re going to start with the light green thread and feather stitch around the edge of the hoop. I’ve never used the feather stitch before this project. I was surprised with how much I liked it. It’s easy, quick, and pretty. What more could I want? The feather stitch is a great way to create vines and ivy. After completing the wreath, place a dark blue, double wrapped French Knot on each “leaf” on the inside of the wreath. Keep going around the circle. My fabric is very thin, so you can see the connecting threads under the fabric. That really started to annoy me, so I went back and cut the connecting threads and tied them off. Use the magenta thread and place double wrapped French Knots on each outside “leaf.” Keep going around until the circle is complete. The finished floral wreath. Use your pencil to draw a cursive initial in the center. I chose “J” because my grandlittle’s name is Jessica. Use the magenta thread and Stem/Outline Stitch the initial. If you’re not a fan of the Stem Stitch, the Back Stitch would also look pretty! Once the initial is stitched, the project is complete! Are you following us on Instagram yet?! You should be!